One of the much loved features of WooCommerce is that you can find a suitable extension to get a specific functionality on your store. With plugins available for any feature, big or small, you will be able to keep your website quite light and focused. However the vast availability of plugins on the WordPress repository as well as third party websites can leave you spoiled for choice. More importantly, choosing high quality plugins is a requirement for the safe and smooth functioning of your WordPress site. In this article, we will list some of the best trusted WooCommerce extension plugin stores, from where you can buy premium plugins. 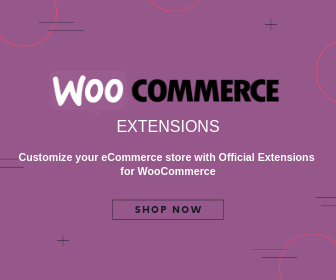 One of the best places to buy WooCommerce extensions is the official WooCommerce extensions store. You will find a large variety of popular WooCommerce extension plugins here. You will find a variety of plugins suitable for your logistical and technical requirements on WooCommerce extensions store. Among these are a great range of payment gateway extensions as well as shipping carriers. 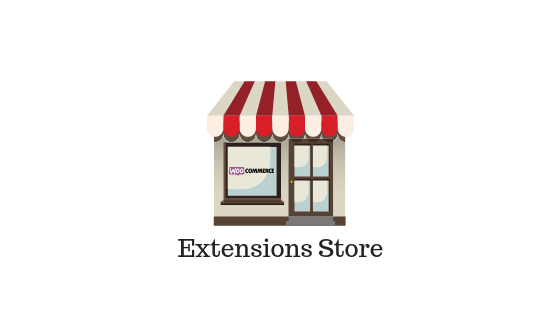 There are extensions for a wide range of categories on the WooCommerce extensions store. We will take a look at some of the prominent categories and the popular WooCommerce extensions in those. Depending on your store strategy and product range, you can make several enhancements to your WooCommerce store. WooCommerce offers a range of features and functionalities through plugins to enhance your site. 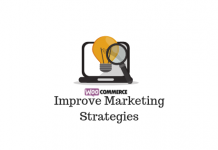 WooCommerce offers extensive choices to help with your marketing efforts. There are extensions to help with email strategies, reporting, social media integrations, etc. You will also find multiple options on the WooCommerce extensions store to help you in setting up discount coupons and deals. In the Marketing section, you will find the below categories of plugins. WooCommerce offers a few different product types by default. In addition, you can use several plugins to create unique product types on your store. Subscriptions, Bookings, etc. are some of the popular unique product types that you can create using extensions. You may find it really interesting that there are several options to add features to your WooCommerce store. Equally important is an option to set up tools that will help you with store management. 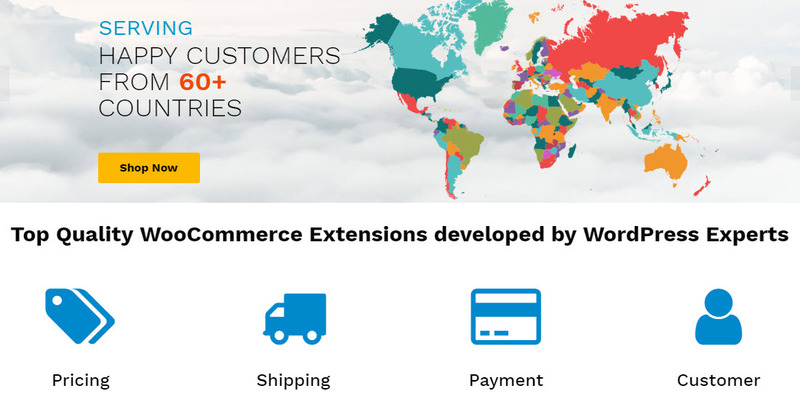 On WooCommerce extension store, you will find a variety of WooCommerce extensions for this purpose. The following categories of plugins you will find under the store management section on Extensions store. 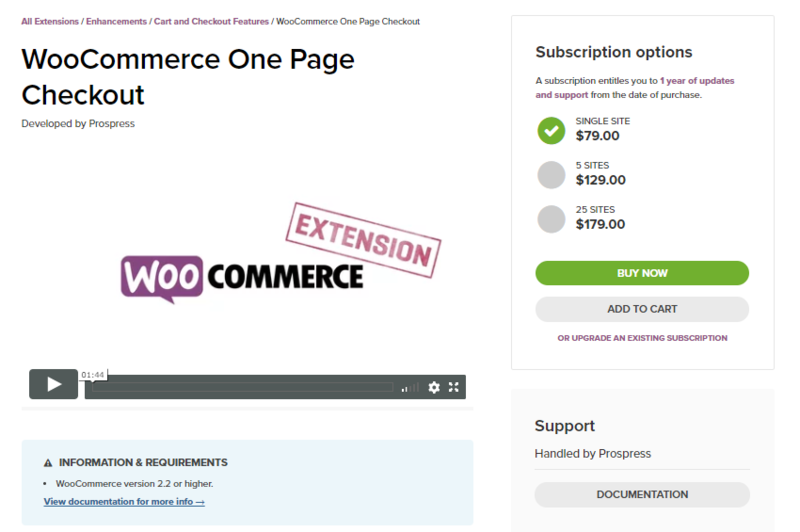 We will list out some of the popular WooCommerce extensions to look out for. 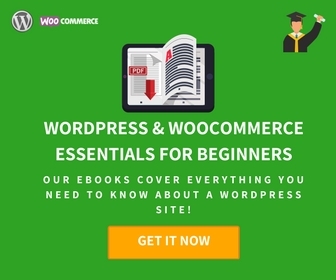 This is one of the most powerful plugins available in the WooCommerce extensions store. With the help of this plugin, you will be able to sell bookings on your store based on time or date. You can create fixed booking slots on your store, or allow customers to choose a booking window to their liking. And, customers will have the option to define the number of people in a booking, and accordingly you can offer discounts. The plugin also allows to define custom costs based on different parameters. Moreover, it offers an intuitive interface that will help you manage your bookings effortlessly. In addition, you can send notifications for booking confirmations, reminders and other information. 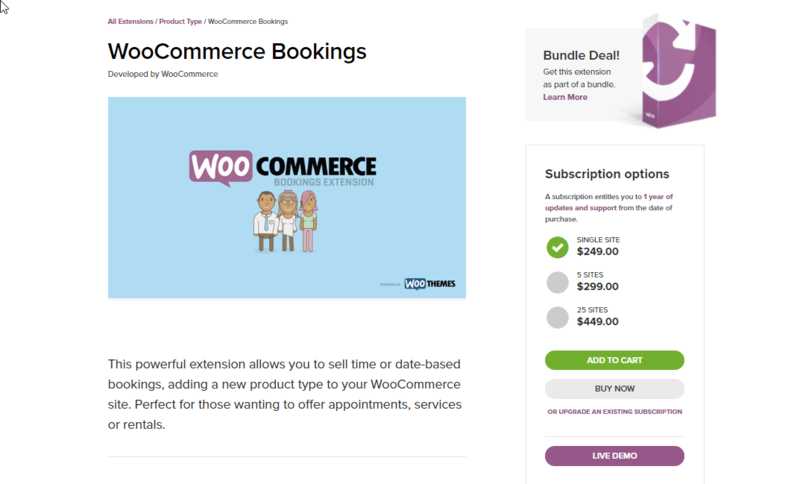 The WooCommerce Bookings extension is one of the best options to set up a booking system for your store. WooCommerce Subscriptions is another hugely popular plugin that powers a lot of online stores. By selling subscriptions on your store, you can ensure a recurring income on your store. When coupled with automatic recurring payments, subscriptions are a great business model in terms of financial viability. WooCommerce subscription plugin helps you create a range of subscriptions on your store for both physical and virtual products. You will be able to create multiple billing cycles according to the requirement of your store. The plugin also helps to integrate your subscriptions with several payment gateways that allow automatic recurring payments. Subscribers can upgrade or downgrade the plans and get timely notifications regarding renewals. You will be also able to generate insightful reports using the plugin. 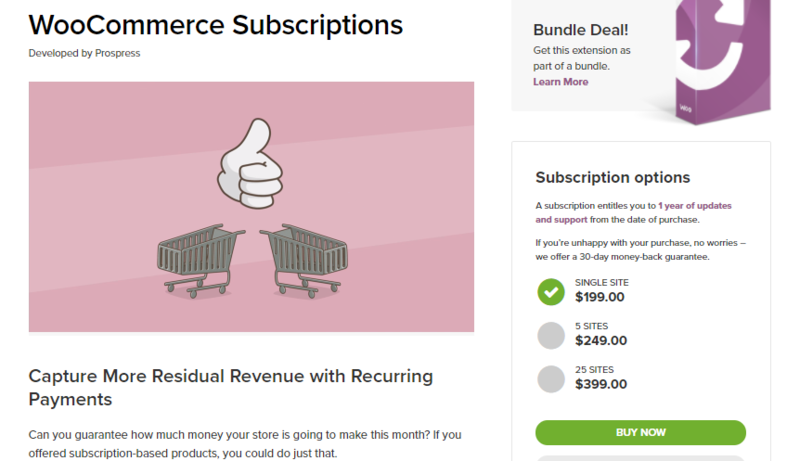 Subscriptions are a great way to ensure recurring income on your WooCommerce store. The main advantage of using this plugin is that you can let your customers checkout from your site on the same page they choose products from. This is really a good improvement to the customer experience on certain stores, as customers are clear about the checkout flow. One page checkout pages can be created easily with the help of this plugin without the need for handling any code. Moreover, you can create custom landing pages on your store when you are hosting special events or promotional deals on your site. This plugin is compatible with a variety of other WooCommerce plugins like subscriptions. WooCommerce one page checkout provides great options to create a checkout flow in a single page. Apart from WooCommerce, you will find several other third party companies that provide top quality extensions for your WooCommerce store. ELEX is one such popular store that offers a range of user friendly plugin to help you offer superior experience to your customers. One of the distinguishing features of ELEX is their superior support team. ELEX offers a dedicated and expert support team that is capable of resolving WooCommerce problems in quick time. Moreover, they are able to customize their extensions to suit any unique requirements on your store. Detailed documentation and video tutorials will assist you in setting up an ELEX plugin on your store. Moreover, all their plugins have a live demo which will be really helpful to understnad the user interface and functionalities. ELEX offers a range of high quality plugins in the following categories. We will look at some of the popular ELEX plugins as well. This is one of the most popular pricing plugins in the WooCommerce ecosystem at the moment. Websites across the globe use this one for their varied pricing needs. The signature trait of this plugin is its flexibility to be able to use for diverse pricing scenarios. With the help of this plugin, you will be able to create discounts at cart, product and category levels on your WooCommerce store. The plugin allows you to make price adjustments as percentage value or flat rates on your store. You can also personalize your store pricing by offering special discounts to chosen customer emails or user roles. Find more details here. This plugin helps you automate USPS shipping process on your WooCommerce store, if you have a Stamps.com account. With the help of this plugin, you can display live USPS shipping rates on Cart and Checkout pages, get automated box packing, print labels and provide tracking information to customers. Being able to manage the entire USPS shipping process from your WooCommerce store admin would be really a good deal for busy shop owners. A good tool to manage customer queries and interactions is a basic need for any WooCommerce store owner. 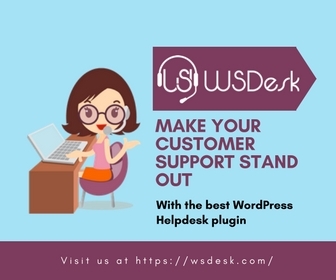 WSDesk proves to be a great solution with its seamless integration to WordPress and WooCommerce. It saves you from the hassles of cloud-based customer support tools by offering an on-premises solution that actually works. You can interact with your customers with tickets generated through the website contact form as well as emails, which will be automatically converted to tickets. The plugin will also help you manage your workflow efficiently and consequently create a smoother experience for your customers. Checkout this article to know more about how WSDesk can help with your online store’s workflow management. Compared to several other SaaS tools, WSDesk offers store owners better control to their own data, and several advanced features. YITH is another popular site where you will find a lot of high quality WooCommerce plugins. They have a set of highly user-friendly plugins that are constantly updated. YITH plugins are constantly improved based on the feedback by customers and will help you solve a lot of practical eCommerce problems. You can expect great customer support when you purchase one of the popular YITH plugins. Moreover, you will find a live demo and detailed documentation to understand the plugin before you purchase. YITH offers a great range of plugins and themes to help with your WooCommerce store strategy. Some of the important categories of plugins that you will find on YITH site are as follows. Here are a few plugins from YITH that you may find interesting. Adding reviews to your WooCommerce store will be a great way to improve the conversion rate on your WooCommerce store. You will be able to devise a comprehensive strategy around your store reviews using this YITH plugin. Your users will be able to add a title to their reviews so that it will catch the attention of other store visitors. Moreover, you can use a color scheme to improve the layout of your reviews. And, a graphical representation of the available reviews will provide a better perspective to customers. CodeCanyon offers a range of good quality plugins suitable for multiple eCommerce platforms. You will find a good range for WooCommerce as well. All their products come through rigorous quality testing and are often priced competitively. You will find tools for inventory management, customer interactions, payment support and more. Overall, you will find a great range of tools that will help your store run more smoothly and offer the best experience to your customers. You will find a large range of high quality extension plugins for WooCommerce on CodeCanyon. WisdmLabs boasts a “Gold Expert” title from Automattic as WooCommerce specialists. Apart from several custom services for eCommerce owners, they also provide a set of useful plugins that you can purchase. For WooCommerce store owners, they offer services in the following departments. WisdmLabs is a bunch of certified WooCommerce experts and provides high quality services and plugins. You will find plugins to help you with customer interaction, setting up product pages and e-learning integration in the WisdmLabs website. PluginHive is reputed as WooCommerce shipping experts. They have a large variety of shipping plugins that provides great user experience. You will find integrations with the leading shipping carriers across the world. Great customer service from a bunch of WordPress and WooCommerce experts is what you can expect when you purchase one of their plugins. You will also find detailed documentation for all their plugins including video tutorials. The Live Demo available on each of the product pages will be a great help to get to know their plugins better. PluginHive offers feature-rich and intuitive plugins mostly related to WooCommerce shipping. Tyche Softwares offers a bunch of solutions that will help you with your store management, order fulfillment and in improving conversions. Their plugins are flexible and offers a great interface to help you manage them without much technical knowledge. Moreover, you will find a great set of “how to” documents to get through the configurations. Furthermore, you will find a greatly reliable customer support team to see you through any hiccups while using their plugins. Here are some of the categories of WooCommerce plugins that you will find on Tyche Softwares site. Where to find free WordPress plugins other than repository? How to start a WooCommerce store from scratch?